The play is based upon the Warner Bros. motion picture, A Christmas Story, written by Jean Shepherd, Leigh Brown, and Bob Clark and on the book, In God We Trust, All Others Pay Cash, by Jean Shepherd. “This play is adapted from the movie, so it contains much of the movie’s humor and charm,” explains Director, Nancy Steinke. All the elements from the motion picture will be on stage, including the family’s temperamental exploding furnace; Scut Farkas, the school bully; the boys’ experiment with a wet tongue on a cold lamppost; the Little Orphan Annie decoder pin; Ralphie’s father winning the infamous “leg lamp;” and much more. 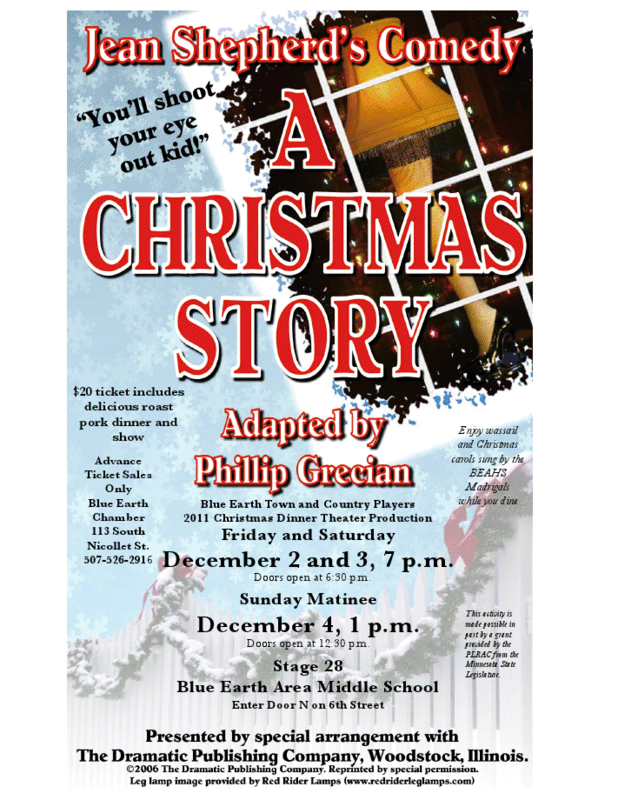 Show dates are December 2-4, 2011, on Stage 28 in the Blue Earth Area Middle School (enter through Door N on 6th Street). This entry was posted in News from BE T&CP! and tagged Events by admin. Bookmark the permalink.